Monomaniacal Westerners – they have one thing on their minds: it begins with an “R” – have come to think and speak of apartheid as a theory of white supremacy. The South African policy of “separate development,” as it was admittedly euphemized, was not a theory of racial supremacy, but a strategy for survival. To the existential threat they faced on the Dark Continent, Afrikaners therefore responded by circling the wagons metaphorically (much as they had done, literally, during the 1830s) and devising the corpus of racial laws known as apartheid. “We shall fight for our existence and the world must know it. We are not fighting for money or possessions. We are fighting for the life of our people,” thundered Prime Minister Hendrik Verwoerd (1958-1966). Malan’s successor, Prime Minister Strijdom (1954-1958), believed unswervingly that if they were to survive as a group, the whites of South Africa would need to retain a position of guardianship, and that ultimately, white hegemony was indispensable for the good of all. Hermann Giliomee – author of the grand historical synthesis, “The Afrikaners: Biography of a People” – agrees that Afrikaner anxieties were overwhelmingly existential, rather than racial. Giliomee is adamant that the apartheid policy did not spring from “racist convictions or antiquated religious doctrines” (even if these convictions were at times present in specific Afrikaners themselves), but from an overriding need for security. For leading thinkers in the NP such arguments almost completely missed the point because the security of the Afrikaners as a dominant minority, and not as a race per se, was what concerned them. This is an historical account of how the Afrikaner intelligentsia viewed a policy against which the writer and her family fought. A writer need not agree with it to chronicle and analyze it. 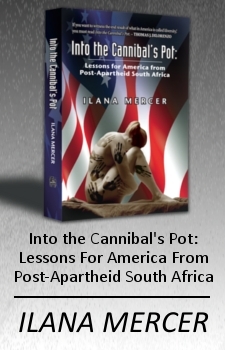 Citations are from “Into the Cannibal’s Pot: Lessons For America From Post-Apartheid South-Africa” (2011) by Ilana Mercer, who has been writing a weekly, paleolibertarian column since 1999. She’s on Twitter, Facebook, Gab & YouTube.